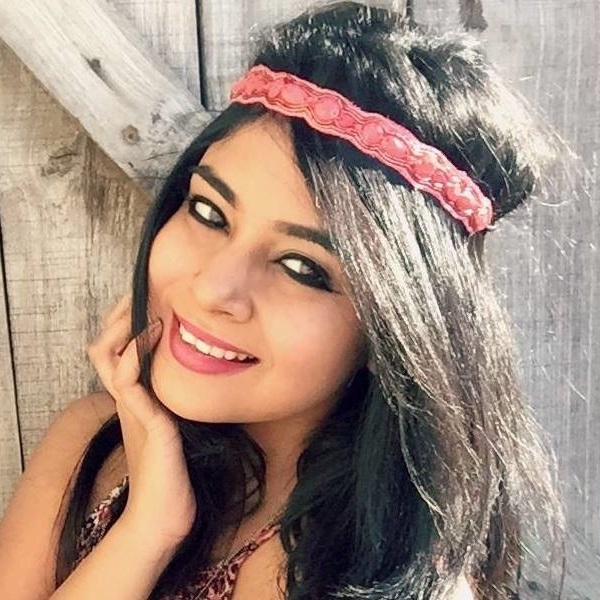 A complexion that’s free from blemishes, acne and spots is what every girl dreams of having! Unfortunately, no matter how hard we try, those period pimples and overall dullness generally come in the way of those dreams. That’s the time when one should befriend a bottle of foundation! Don’t be fooled by its size, this makeup product was invented to cover up flaws and improve the appearance of your skin. A tiny drop is all you need for the magic to happen! However, when it comes to purchasing a foundation, it’s not easy to select the perfect shade for you. The most common problem that girls have is that It’s either a shade lighter or darker than her actual complexion. To make a good splurging decision, ask the store’s salesperson for assistance. Once you get your shade, come back here and learn how to apply it! While some women are comfortable with using their fingers to apply foundation, we don’t recommend it. Your fingers may have dirt and bacteria on them and when that comes in contact with your skin, it could break you out. There are plenty of makeup tools out there that make application processes a smooth experience. Plus, these tools help blend the foundation seamlessly, giving it a much more natural-looking finish. Before we tell you how to apply foundation on your face, let’s get you familiar with the tools first. For medium-coverage foundation application, you should invest in a dual-fibre stippling brush. It’s one of the best makeup tools for applying foundation. The beauty of owning a dual-fibre synthetic brush is that the synthetic part helps to apply and spread the foundation evenly on your skin while the natural bristles help blend the product well into your skin. Isn’t that amazing? A beauty sponge is one of the best foundation applicators to invest in. When soaked in water, it actually doubles in size! It’s perfect for stippling on foundation and it gives your skin a luminous, radiant finish. Just remember one thing, each time you use your beauty sponge, make sure that you wash it in warm water and leave it to air-dry. Take care of your beauty tools if you want to reuse them more often. For a full-coverage foundation look, opt for a kabuki brush. It works amazingly well for powder foundations and can be used to blend and stipple. It not only works wonders for foundations, but it also works well for tinted moisturisers as well. Synthetic brushes are great for giving your skin that lovely airbrushed foundation finish. The best part is that while using this brush, you actually use less product than you would if you applied foundation using a makeup sponge or your fingers. Beauty sponges tend to absorb more foundation product. Whereas, it’s different with silicone sponges. They spread foundation on your skin evenly and no product goes to waste post application. Plus, it’s easier to clean as compared to a beauty sponge. Never apply foundation if your face is not cleansed or moisturised. If your skin is dry, the foundation product will start to settle into creases and dry patches and look cakey - neither is a pretty sight. After washing your face, pat it dry with a towel and apply moisturiser. Before applying foundation, wait for 15 minutes so that product absorbs well into your skin. 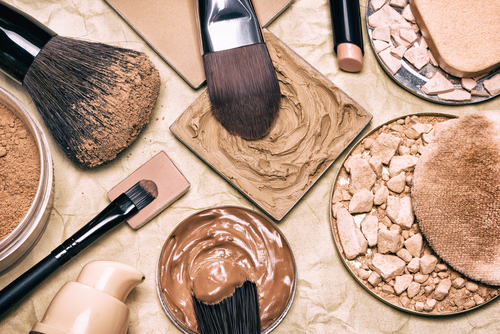 All the foundations you find in the market today mostly fall under these 3 categories - sheer, medium, matte/full-coverage. For those women who are comfortable with showing off those freckles and beauty spots, a sheer coverage foundation is a good choice. 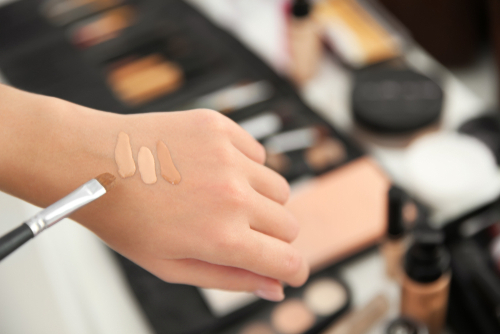 To even out your skin, you might want to settle for a foundation that provides medium coverage. And finally, if you have dark blemishes, wrinkles, fine lines or hyperpigmentation, it’s best to use a foundation that either reads matte or full coverage. Never buy a foundation from the store without trying it on your skin first. Sometimes, the colour of the foundation may look like a certain shade on the bottle, but when applied on the skin, it’s different. Instead of testing it on your hand or neck, it’s important to apply all over your face (with a foundation tool, of course). The best way to know whether the shade matches your skin is by checking it in the light. Try not to depend much on artificial lighting. Natural light is the best way to find a foundation shade that matches your skin tone. After applying foundation, you should finish your base by using loose powder, fixing spray or a face mist. Women who like that matte finish should opt for loose powder. Since fixing sprays and face mists help melt the powder into your skin, it helps to give your skin a natural, dewy finish. Now, for the main part - how to apply foundation. Three textures, three different ways! 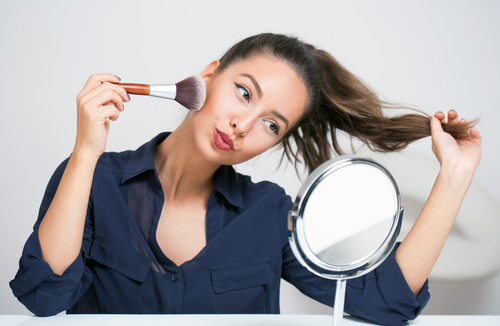 To get the coverage you want, you must learn how to apply your foundation using the right beauty tools. It’s not rocket science, so don’t worry, you’ve got this! Step 1: Use a cleanser first to wash your face and later apply a moisturiser. Step 2: Give the product some time to absorb into your skin. After 5-10 minutes, apply a primer. Step 4: Use the broader end of the sponge to pick the liquid foundation product up to apply it to your face. Step 5: In a bouncing motion, blend the product from the centre of the face, outwards. Step 6: For tough spots like the area under your eyes or around your nose, use the pointy tip of the beauty blender to apply the foundation. Step 7: To set your base, apply translucent powder over your foundation. Ideal Skin Type: Oily and sensitive skin types. Step 1: Cleanse your face, moisturise and apply primer later on. Step 2: Apply concealer to cover dark spots, dark circles and blemishes. Step 3: Now, pick some product up with a powder brush and in a patting motion, apply it to your cheeks, forehead, chin, the bridge of your nose and under eye area. Blend, blend and blend some more! Ideal Skin Type: Sensitive, oily and combination skin types. Step 2: Empty some loose powder foundation product from the bottle into the lid of the product. Step 3: Now, swirl your kabuki brush around the lid and tap off the excess product because less is more in this case. Step 4: Start at the larger areas of your face and buff your skin in circular in motions. Until one area of the face is blended in well, then move to the next. Step 5: If you feel you need more product for better coverage, use more. 1. If you’ve looked at every makeup store, tried a million swatches and still haven’t found your particular shade, then what you should do is buy a shade that’s one tone darker than your natural complexion. Mix it with a lighter foundation and there you have it, your perfect shade! 2. If you’re looking for a dewy finish, why don’t you mix a bit of facial oil with your moisturiser? Prep your skin with this first and then apply your foundation how you normally would. 3. The French usually like their skin and freckles to show through their foundation. You too can press a tissue on your skin post applying foundation for that natural look. 4. Apart from a flat top Kabuki brush, look for powder brushes with synthetic bristles. Even though they’re meant for applying loose powder, a brush like this one works amazingly well for blending foundation. 5. Before using a foundation brush, mist it with a facial spray. This trick helps to set your makeup better. 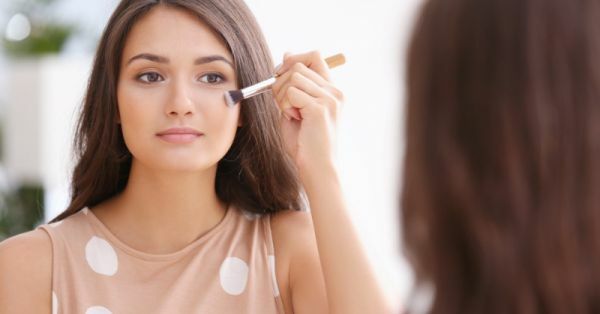 The best part is that you can do the same trick for applying blush, highlight and bronzer! 6. For women who have dry patches on their skin can simply stick on scotch tape over the area. Wait for 30 seconds and pull off the tape. This helps to remove the layer of dead skin and smoothens the surface of the skin. 7. Unless your skin is covered with acne and spots, only then you must apply foundation all over your skin. If you have only a couple of spots, then just apply some on those areas and not all over. 8. When using a beauty blender, dab and don’t rub. 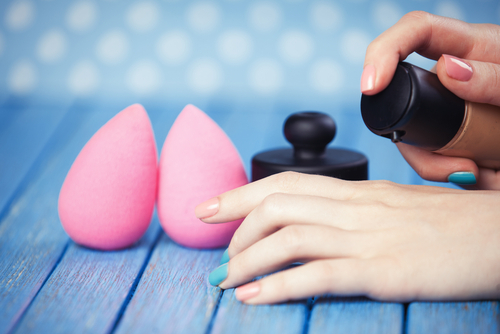 If you want that dewy finish, soak your beauty blender into a bowl of warm water and then use the makeup sponge to apply your foundation. 9. Take good care of your foundation tools post application. For brushes, wash them under warm running water and for beauty sponges, soak them in a bowl of warm water. Gently squeeze the sponge so that all the product comes out. Air-dry both tools. 1. Does Foundation Ruin Your Skin’s Texture? Not really. In fact, applying foundation can protect your skin from sun damage and pollution in the air. However, it’s better to layer it with sunscreen to be safe. As long as you cleanse your skin every day, you don’t give a chance for the foundation to clog your pores. But it’s best to give your skin a break and let it breathe by going makeup free ever so often. 2. Why Does The Foundation Turn Orange? Is It Normal? This is usually caused when your foundation oxidises, which can happen with certain shades and skin types. To avoid this from happening, we suggest that you apply primer first. It acts as a barrier between makeup and your skin. 3. Should You Be Applying Foundation Every Day? This one entirely depends upon you. As long as you prep your skin before applying foundation, it should be fine. If you feel that foundation is too heavy for your skin, you’re free to stick to other makeup alternatives like BB or CC creams. 4. What’s Better - Liquid or Powder Foundation? Only your skin type can take a call on this one. For oily, acne-prone and sensitive skin, we would suggest that you choose powder foundation. For dry and normal skin types, liquid foundations are your best bet. 5. Concealer Over Foundation or The Other Way Around? Either way is fine. 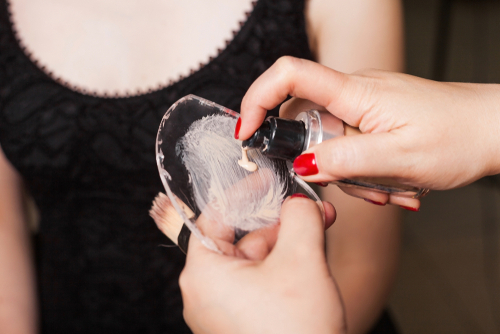 If you’re new to makeup then we would suggest that you apply foundation first. If you still see spots and zits, you can apply concealer to those areas for a flawless finish.